Youth flag football is a popular variation of American tackle football for kids and is similar to touch football. Since the sport can be played by anywhere from 4v4 to 9on9 players to a side, kids flag football sets can range widely in the number of players they are geared to accommodate, it is important when choosing equipment to pay attention to this factor. The goal of this article is to inform about the best flag football kits and sets for kids that are available and to provide in-depth coverage to help pick the right set for your child or children this Winter 2019 season (as well as a possible Thanksgiving Day backyard game). What you will find below is a review of the 10 best flag football sets and kits for kids, plus two to avoid. 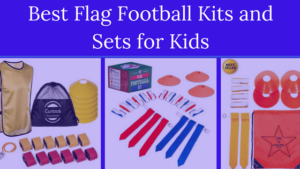 2019 Buying Guides to the Best Youth Flag Football Sets and Kits: Grab some Flags and Cones. Let’s Play Ball! Fun Plays for a 5 on 5 Game of Flag Football! Flag-A-Tag Sonic Boom Flag Belt Set of 12 Review: The full Flag-A-Tag flag football equipment kit is not yet available, which is why this is included at number 10. However, this Flag-A-Tag product is the replacement belt and flag kit, with the added attraction of being able to use the sonic boom system with the flags. Flag-A-Tag has long had a good reputation among users of their flag football products. Specifically in adult flag football, it is often a requirement to play with this brand’s flags. The reason is because of the “pop” sound they give off when pulled, which clearly marks when the player is “down”. If you’re just looking for belts and flags, this is one to consider. Flag Football Set and Referee Kit 12 Player by Curious About Fitness Review: Curious About Fitness seems to place a premium on some of the extras that most parents value for their children and for their budget. For this reason, it’s considered the most complete flag football kit for kids. The all-weather equipment is “rip resistant”. They provide three “long heavy-fabric” flags per belt, attached by velcro to their 48-inch adjustable nylon belts. The benefits to you of these features is that the sturdier equipment provides less chance of injury, and less need to replace the flags and belts. This is the only one of the 12 packages reviewed here that comes with two carry bags for all of the equipment: A PVC carry case with a handle, and a drawstring stuff bag for extra equipment. They have even thought about the referees that are used in league games, by including a referee kit, with a high visibility vest and a whistle on a yellow lanyard. However, the referee kit can also be fun for Dad or Mom to use in refereeing family games. This is a set, unlike some others, that is geared for flag football games for both kids and adults. As a bonus their money back guarantee does not appear to have a 30 day restriction, since it states: “If you’re not 100% satisfied with your new flag football kit contact us for a full refund”. Trained Flag Football 10-Man Set Review: The Trained Flag Football Set is designed for every level of play, from youth through the more rigorous games played by adults. Parents of young kids should note that this particular set is advertised as a “10 Man Set”, which means 5 players on each team, allowing for four more players than the three per team sets. The 46 pieces include end zone cones, a bag that doubles as a yard marker, an e-book with plays, and, important when targeting both youth and adults, flag belts with adjustable waist sizes. The biggest differentiators are the carrying case, the durability of the flags, and the belts holding three flags, as compared to the two flags provided by a number of other companies. Parents buying a set for their kids will benefit from all of the additional items that come with this set, which you will then not have to purchase individually. This set, like many others, does not come with a football. Do not be too concerned about whether any set includes a football or not. Most players, except for maybe the more experienced players, will want to choose their own football anyway. Flag Football Deluxe Gear Set by Star Active Sports Review: This Star Active Sports set is fit for 5v5, as it comes with 20 durable flags, all with sure-grip Velcro closures to attach securely to belts. What this means for you, as parents considering purchasing for your children, is that Velcro, often preferable for its strength and durability, is more suitable for youth flag football than adult. Also, keep in mind that 20 flags means two teams with five players each and only two flags per belt. Many leagues prefer three flags per belt and anywhere from six to 11 players per team. 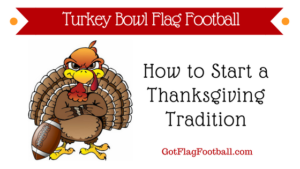 However, if you are not buying for a league, and only for family fun, say for a Thanksgiving flag football or small Turkey Bowl game, gear for 10 players may be all you will need. Other positives about this product include the adjustability of the belts and the convenience of the drawstring bag. For these reasons, Star Active Sports can be considered the best velcro flag football flags and belts kits for kids. Nerf N-Sports Flag Football Set Review: The Nerf N-Sports Flag Football Set is aimed at younger kids, more than some of the other flag football sets, which are made for both adults and kids. It does not come with belts for the flags to attach to, but rather has clip-on flags that attach to your own belt, shirt, or the waistband of your pants. Since there are only 12 belts in total this kit is made to play with two flags per belt, one on each hip. With that, it is perfect for the truly beginner level player. More experienced players will want a belt and not just an attachable flag. This set is probably not one that would be used in an organized youth league. The biggest difference from many of the other sets reviewed here is that this one comes with its own, “all-weather” football. The positive points about the ball are its durability, with a plastic coating over the usual Nerf sponge, that it plays as well on asphalt as it does on grass, and that it has excellent flight and spiral capabilities. SKLZ 10-Man Flag Football Deluxe Set Review: This Sklz Deluxe set is for 10 players, five to a side, and contains durable, one-size-fits-most flags. The two downsides, which are common among many flag football packs, are that the four goal line and sideline cones are much too small to see while playing, and the mesh tote is not of adequate size to properly contain all of the equipment, once everything is unpacked. An upside is that the pack contains a rule book. Like most packs it does not include a football. It only has two flags per belt. They are nylon with Velcro attachments and a D-ring closure, allowing for flexibility in movement. Franklin Sports Mini Playbook Flag Football Set Review: The Franklin Sports Mini Playbook comes with its own football, which is emblazoned with receiver routes on it, giving players some ideas about plays to call and run. This is great especially for beginners, however understanding routes is something that takes many, many repetitions over time in order to master. Every exposure, such as this, is helpful! This Franklin Sports kit also has an “Exclusive Spacelace lacing system” that Franklin claims makes the ball easy to grip and throw. However, the ball is not as durable as others, and is considered too small for all but the smallest kids. The set is more cheaply made and the flags do not attach, or detach, from the belts in the traditional manner. Some may view this set as more of a toy, rather than a true sports equipment set. Depending upon how you, as parents, plan for your kids to use the set, the experience could be positive or negative. Franklin’s claim that, “this set is ideal for teaching kids the fundamentals of the game of football” is probably accurate, and perhaps the best aspect of this set. It’s clear this set is targeted for small children, ages three up to around eight. 14 Player Flag Football Set by Stumptown Sportz Review: The Stumptown Sportz Premium package at first seems to be a well thought out set. It is the only one reviewed here that has 14 sets of belts and flags, including the preferable three flags per belt. It comes with 12 “full-size” playing field marker cones, and a mesh bag for storing all of the equipment. But on closer inspection, the flags rip easily, the cones are nowhere near full size, and the overall package appears to be rather cheaply made, especially for a higher priced product. For parents looking to buy for kids, thankfully a 30 day full refund is included, in case upon inspection it does not appear to fit your needs. 12 Player 3 Flag Football Set by WYZworks Review: The WYZworks Velcro Premium has some positives that may sway parents researching sets for children or family to choose this set over others that are reviewed here. It has flags and belts for 12 players, and includes 3 flags per one-size-fits-most belt, rather than the more common two flags. It also claims to have a strong durable nylon webbed belt with a D-ring closure, with quick release Velcro attachments, which usually make for durability and greater safety. However, for a higher priced than most package, which does not include a football, or cones, and, most importantly, with a poor history of flags that rip and tear easily, it’s suggested that you take a close look before choosing this package. If you decide to choose this set a smart purchase decision may be to consider buying extra flags. Spectrum Flag Football Set of 12 Review: When you order the Spectrum Multicolor , the claim is that you can choose from purple, green, blue, red and orange flags, so you can play ball sporting your favorite team’s colors. What they don’t tell you is that, for some odd reason, all of the flags you receive may be of the same color. So everyone playing had better have the same favorite team, and not care that both sides in your flag football game will be wearing the same colors! Most importantly, the belts and flags are known to fray sooner rather than later. This is described as a low cost set, and, as usually holds true, you get what you pay for with this package. 14 Player Flag Football Deluxe Set by Play Platoon Review: Play Platoon claims that “These belts, cones, and flags are made with heavy duty, durable materials designed to withstand years of rough, rowdy games”. Parents, we advise “buyer beware”. The actual customer experience with the Play Platoon flag football set does not match those claims. The belts and flags appear to rip easily and require early and frequent replacement. Play Platoon claims to stand behind its Flag Football Sets with a full money-back guarantee. If you purchase these, you may need to utilize that warranty more often than they planned, if Play Platoon doesn’t improve their product sooner rather than later. Champion Sports Triple Flag Football Set of 12 Review: It’s strongly recommend that parents avoid this product. Champion Sports has many angry customers who indicate that the promised “Set of 12” is clearly only a set of one belt and two flags, enough for one player, not even enough for a one-on-one game of flag football. Champion Sports has not seemed to respond to the customer complaints, earning its place on the lowest rung of the flag football kit ladder. Flag-A-Tag: Flag-A-Tag has as its tag line “The Ultimate Flag Football Equipment Source”. Research reveals that Flag-A-Tag was, at the time they were acquired by the much larger online sports equipment company, Esportsonline, the largest supplier of flag football belts to the NFL, as well the exclusive official supplier of flag football products to the NFL’s “Air It Out” program with Nike. 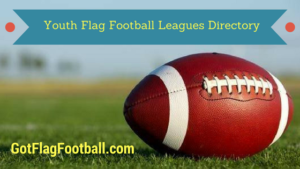 Those two affiliations would propel any flag football supplier to the top of its industry. And losing those affiliations would most likely be a significant revenue hit for a flag football company. This could help to explain why Flag-A-Tag’s product reviews have declined recently, since they have lost those affiliations. To regain their former glory some changes need to be made by the parent company. Star Active Sports: Star Active Sports is the only flag football company among the 12 reviewed here that makes giving back to their local communities a key part of their marketing. When you purchase their flag football equipment Star Active Sports makes donations of products to local schools and underprivileged youth. The many positive comments from users, and the popularity of their customer service area, reflect on the fine reputation of Star Active Sports. Franklin Sports: This is the same Franklin whose name you see on major league baseball players’ batting gloves when they are batting on television. So you know they are an experienced and respected sporting goods company. If you’re a parent looking to buy a flag football set for your children between the ages of three and eight years old, Franklin can provide just what you need. Kids will love the sizes of the different pieces of equipment and, along with the playbook that is included; it is a great way for young children to learn how to play football, while they are having a lot of fun at the same time. What Franklin needs to do in order to increase their overall customer satisfaction ratings is to do a better job of communicating up front that this set, unlike many of their competitor’s sets, is made for kids between the ages of three and eight, not for older children, and certainly not for adults. Many parents have played touch football as kids (or with their kids). So you know that touch or tackle football could get very physical, and arguments could easily ensue over whether a player was touched with two hands or not. With the desire of parents to have their kids avoid both injuries and arguments, and with the increased concern among parents about head injuries from tackle football, the popularity of youth flag football has grown in recent years. As a result the amount of choices, and quality, of flag football equipment has increased in response to the demand. Let’s have a look at some of main factors to think about before you decide on a set for your kid(s). Since there are so many variables between flag football games, whether playing in your backyard, or in an organized youth league playing on the local school football field, it is important to know what type of game you want to play. That will help more than anything to determine what type, and quantity, of equipment you should purchase, and what price you should be willing to pay. Flags: Flag belts come in two general styles: simple flagged belts that detach at the buckle when pulled on, and “sonic” flagged belts that emit a noise when the flags are detached. The simple non-sound emitting belts are relatively cheap and easy to use for amateur play. The sound emitting belts aid in establishing when a player is down and are better suited to leagues and official play. Football: It is important to choose the proper sized football, depending mostly on the age of the players, and whether the game is casual or part of a formal league. Sizes vary, with different patterns and materials on footballs affecting grip, texture, and durability. Several of these sets come with a football, but even in those cases parents purchasing for kids may prefer, based on input from their children, to choose to buy their own football. Jerseys: Two different colored jerseys or pinnies are needed to distinguish teams from each other. Flag football jerseys can be as simple as mesh primary colored shirts, or as complex as standard league football jerseys, depending on the level of competitive play. Miscellaneous: The most common extra equipment you might need – such a referee gear – are included in some of these packages, and not included in others. So make a list of what equipment you want, and cross check that list with the packages you are considering purchasing. It is best to check the rules of your league, or the desires of your backyard family flag football participants, before purchasing, and then playing and finding out, for example, that some players may be much more competitive, and physical, than others, therefore requiring you to re-think the products that would suit your players best. Quantity: The main criteria for deciding the quantity of belts and flags needed is the number of players you will want to have on each team. Team sizes will vary from as few as three to as many as 11 to a side. Therefore you will need anywhere from six to 22 belts. Depending upon if you prefer two or three flags to a belt, you will want to order from 12 up to as many as 66 flags. Keep in mind that both belts and flags will break. So you may want to order some extras up front, to avoid having to go back and order more, and having to pay, and receive deliveries, a second time. Value: The price points of the 12 flag football equipment sets reviewed here vary, but they all have one thing in common. What’s that you ask? They’re all designed to save money compared to buying all the items individually. That said, it is essential to know which items are important for you to have, and which you can do without. If you’re just looking for a set of the best flag football flags, and you already have the cones, pylons, etc, it might be a better value to buy just the flags. If you decide to buy a kit or set and save, yet you’re concerned about replacement parts, remember too that you can always order partial replacement sets later, especially when it comes to the essential belts and flags. Durability: Durability is what separates the high-quality equipment from “copy-cat” gear. The equipment sellers will always tell you that their products are durable. It is from the users who have actually tried these products, under real live game and practice situations, who will tell you the truth, about the durability of these products. Do your due diligence! All of the flag football kits will come with the basic equipment needed to play the sport: belts and flags. The material they are made with, the types of attachments between the belt and the flag, whether there is a sonic component that emits a sound when the flag is pulled off, the colors of the flags, these things will vary from set to set. The rest of the equipment can be considered accessories, the bells and whistles of the kit. Except, of course, what many consider the most important piece of equipment, the football. As previously mentioned, do not be too concerned about whether a football is included. Most players will want to choose their own football. The rest of the equipment, the cones, carrying bags, playbook, rule book, and even referees’ equipment, will vary from package to package. Flags and Belts in Bulk? As mentioned above, once you have determined how many players you would like to be able to provide equipment for you may want to consider purchasing extra belts and flags, as replacements for the flags and belts that will inevitably break over time. It is also wise to factor in the playing styles of your players. Sometimes the youngest players can be the hardest on equipment, but other times it can be the older weekend warriors who end up ripping things apart. Either way, be prepared!